After trying and really enjoying the tom yum grilled fish I came across the grilled shrimp version on About.com: Thai Food . How can you go wrong using the tom yum paste that is used to make the amazing tom yum soup and grilled skewered shrimp? This time when I looked at the recipe the fact that the shrimp was skewered reminded me of a Thai style satay only using a marinade with more fresh ingredients such as the lemongrass, cilantro, green onions, fresh birds eye chilies, etc. There was no way that I could pass up on making this shrimp dish and I got to it on the weekend. The tom yum grilled shrimp was as easy to make as pulsing the marinade in a food processor, marinating the shrimp for a while and finally grilling them for a few minutes on both sides. For the minimal amount of effort these shrimp took to make they turned out excellent! The shrimp were nice and juicy and super tasty! Although the shrimp were flavourful enough to serve by themselves you could also serve them with a spicy Thai peanut dipping sauce if you like. One thing that I really like about simple meat dishes like this is that you can serve them as an appetizer by themselves or with a dipping sauce or you can use them as just another tasty component in other dishes like salads or sandwiches. Place the lemon grass, garlic, galangal, chili, cilantro, lime juice and zest, green onions, shrimp paste, fish sauce, oil and palm sugar in a foor processor and process. Marinate the shrimp in the paste for at least 10 minutes. Grill until cooked, about 2-3 minutes per side. What a great Thai dish! I love to try it on my next BBQ party. hi – i just stumbled upon your site the other day. i signed up to receive your posts in my email. thanks so much. i love the pictures. the recipes i've seen so far look great. this shrimp sounds terrific. i'm really liking your stuff. thanks again. You are so cool Kevin! I love the idea of this dish. Mmmhhh, shrimpa are so delicious! Those must taste awesome! the flavors of tom yum go so well with shrimp..great recipe. Please just tell me that you shared that with someone and that you did not have all of those delicious prawns yourself!!!! 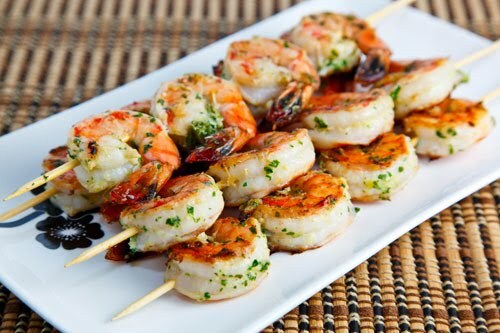 my hubby loves shrimp..I'm sure he will love this…. Wow, Kevin. The shrimp look great! I'm loving all the Asian recipes. Thanks for sharing. These look delicious! Shrimp are uber-cheap here this time of year, so I'm always looking for something new and different to do with them. Will definitely be trying these. Thanks! Can I just move in….PLEASE! These flavors with some grill smoke on shrimp sounds incredible! What fabulous flavors! This looks like a wonderful take on grilled shrimp. tom yum is on my list of things to try… looks delicious! I love all things thai, and I've been looking for something to do with shrimp this weekend!! I'm pretty much a sucker for anything made with shrimp. These look delicious. Now this is one recipe that will fit into my current "low-carb" diet. I love the lemongrass skewers. I do this with chicken sometimes, and I don't know why I've never though to do this with my Shrimp as well. Thanks for the great idea Kevin! We love shrimp recipes! These look nice and refreshing! Does Closet Cooking mean you're in the closet about being gay? These shrimps look AMAZING. I want them right now!!! Fan-thai-tastic! The photo is amazing too, but the shrimp look and sound perfect. Hand me a skewer and some sriracha sauce! With this recipe I can tell you for sure I will have kilos of it 😀 I'm a fan of Shrimps! Tell you what, come over to my hometown island of Penang (across the border of Thailand), we can grill them and other seafood at the beach across the street or at my terrase! I love this!! Your photo is so lovely. Love tom yum, and love shrimps. This dish, and all your dishes look amazing! Definitely found some recipes to try. Kevin, your shrimp dishes just kill me! They are each and every one fabulous looking and I so want to taste every one. I love shrimp! But can you believe I can't buy fresh shrimp here in Nantes? Only frozen and I haven't done that yet. Another beautiful shrimp dish! Too bad I didn't see this when I had my first lemongrass.I'll know where to come. Hi, y'all. I just made this Tom Yum Shrimp AGAIN!! And, I must say once again IT IS FABULOUS!!!! If any of y'all gals ever try it, it probably won't look as gorgeous as Kevin's does, but it will taste fantastic!! I heated the marinade and spooned it onto the grilled shrimp on the plate! Super!! I have been devouring shrimp lately – these looks positively scrumptious! These are so amazing! We've been eating them once a week! Thanks for the great recipe.